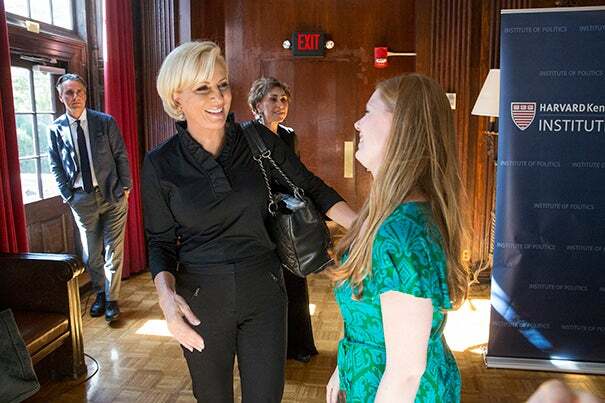 MSNBC "Morning Joe" hosts Joe Scarborough and Mika Brzezinski visit fall fellows at IOP, where they discussed their public falling out with President Trump and Brzezinski's battle for equal pay. Each morning, Scarborough, a former U.S. congressman from the Florida Panhandle, and Brzezinski, a veteran television news reporter whose late father was Zbigniew Brzezinski, the noted national security scholar and practitioner, lead a freewheeling discussion of the day’s top political news, with rotating roundtables of A-list newsmakers, analysts, and journalists. A decade after its debut, the show remains highly influential among Beltway insiders and the Manhattan media set. Until recently, “Morning Joe” was also a favorite of President Trump. But the hosts’ once-friendly relationship with him on- and off-camera curdled last summer. Though the pair had been among the first prominent news figures to take his candidacy seriously, much to the chagrin of his critics, the relationship went south after Trump attacked them on Twitter in late June, calling them “Psycho Joe ” and “low IQ Crazy Mika.” The three haven’t spoken since. Scarborough and Brzezinski, who are also visiting fellows at the Institute of Politics (IOP) at Harvard Kennedy School (HKS) this fall, have become frequent critics of the president and have questioned his fitness for office, calling his presidency thus far “even worse” than they expected. Despite the recent uptick in approval ratings Trump received after cutting a deal on the debt ceiling with House Minority Leader Nancy Pelosi and Senate Minority Leader Chuck Schumer, Scarborough said Trump can’t seem to resist courting his hard right-wing base, even when doing so pushes his poll numbers down. As IOP visiting fellows, Scarborough and Brzezinski recently stopped by Kirkland House to talk with Victoria A. Budson, executive director of the Women and Public Policy Program at HKS, about the fracturing of the nation’s political parties, and about the challenges women face in the workforce. They will return to Harvard on Wednesday for a town hall event, discussing politics and public service. With special counsel Robert Mueller’s investigation into potential links between then-members of the Trump campaign and Russia’s interference in the 2016 election gaining traction, the couple said they would not be surprised if some members of Trump’s inner circle, or even Trump himself, end up facing criminal charges. “Knowing how that organization runs, it is a mom-and-pop operation without the mom. He knows about everything that goes on there. I find it hard to believe that he didn’t know anything about it,” said Scarborough. At Kirkland House, Brzezinski spoke at length about her experiences trying to negotiate a new network contract after learning that Scarborough and her male counterparts on the show were being paid significantly more than she was. It was an awkward, even painful, ordeal, she recalled, but also an enlightening one that inspired her 2011 best-seller, “Knowing Your Value,” which documented the lessons she learned over decades as a working woman. Unlike Scarborough, who confidently strode into the offices of network executives declaring that he could beat the ratings of MSNBC’s then-top rated show, “Imus in the Morning,” and walked out with a contract, Brzezinski said her tentative approach to negotiating was unintentionally self-sabotaging. “I walk in there and I’m like, ‘Well, gosh darn it, I’m hopin’ I’m not gonna let ya down!’ Like that’s really going to get you a deal? No. It’s maybe going to get you an opportunity, but not a deal,” she said. The pair demonstrated for students the different ways Brzezinski had tried to negotiate for herself with the network, “which went really badly.” She copied Scarborough’s tough-guy bravado, she sought sympathy from her boss about her family’s financial needs, and she bemoaned what she thought was unfair, sexist treatment. “They all turned out to be textbook … ‘What Women Do When They’re Negotiating,’ and they’re mistakes,” she said. Rather than feeling uncomfortable about asking for more money, Brzezinski encouraged young women to put aside worries about how they might be perceived and just “be very clear about what it is we need, we want, and we expect out of this relationship. … You’ll find more situations in which you are respected if you command respect with your voice, your face, your words, your tone. You will get it most of the time. You’ll get it much less if you’re hunched over and apologetic. To be their own best advocates, Brzezinski urged women to put aside trying to please or be liked by others. The town hall on politics and public service at the Kennedy School’s Institute of Politics will be Wednesday at 6 p.m. President Drew Faust will introduce Scarborough and Brzezinski, and John Della Volpe, the IOP’s director of polling, will moderate the discussion. Renowned lawyer and HLS professor Charles J. Ogletree Jr., listens during a symposium celebrating his accomplishments, including the announcement of a professorship in his honor.